The rain in Sangkhlaburi persists, causing more flooding. It has reached a point where the bridge to Baan Unrak home is now completely covered with water and is past the waist. The Saphan Mon bridge that connects Sangkhlaburi with Mon villiage, is a 400 meters long, hand made wooden bridge. It will only take about … Continue reading "Mother Nature at her harshest"
Many woman who fled from Burma came to Thailand to build a new life for themselves. Some of these woman were studying and others were teachers. Some found jobs in the Thai community and others tried to pick up their careers as teachers in Thailand. Unfortunately not all of them met the Thai requirements and … Continue reading "Our care givers"
If there are so many children in difficulty in Sangklaburi then it can only mean that there are as many mothers in difficulty too. Our doors have always been open for these ladies. However it is just difficult for them to come. There is a lot of shame involved and it requires a lot of … Continue reading "Healing Mothers’ Heart"
What is Mom doing outside the home? It was a necessity for Didi to leave Thailand. A mistake was made whilst submitting the usual application for the visa extension. The due date was approaching and she needed to exit and re-enter Thailand. It is not easy for the mother of the house to leave. There are many things to be done, to prepare … Continue reading "What is Mom doing outside the home?" Many things were planned when our Meyai (big mother) left the home to go fundraising and renew her visa abroad. There was a plan A and B for everything. Nothing worked out. The weather was certainly not on our side. 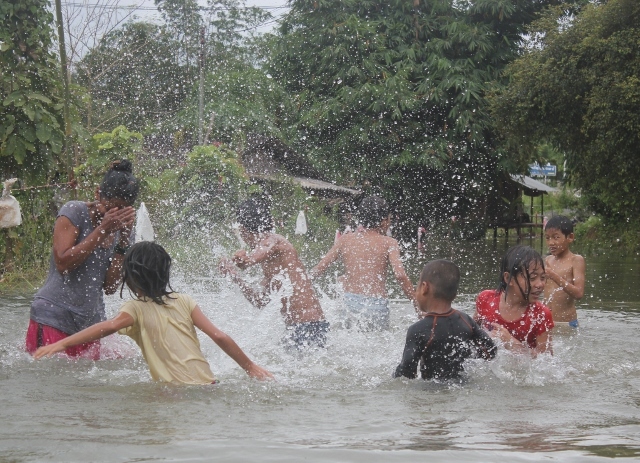 It has never rained so much in Sangklaburi during the last 10 years. The children … Continue reading "What happened when Mom was not in the home"
The big day came and Meyai (Didi) returned home just in time from her trip. She came just in time to witness the smiles and the tears in her children’s faces. The children Welcomed Didi back with so much relief. Now they could perform their ritual of love and appreciation. The children needed Didi to … Continue reading "Mother’s Day"